This is a picture book that I was reluctant to read because it was about a dog who did amazing things. I have no idea why that made me think I wouldn’t like it, to be honest. Sentimental dog stories always get to me. Benji and Balto made me cry. I remember enjoying Lassie as a kid. Heck, even the end of the Futurama episode when Fry finds his fossilized dog makes me bawl uncontrollably. But for whatever reason, I sort of expected this story to be boring and bland. It’s definitely going to be a sentimental favorite for dog lovers, and it’s not at all kooky like the picture books I’m usually drawn to. 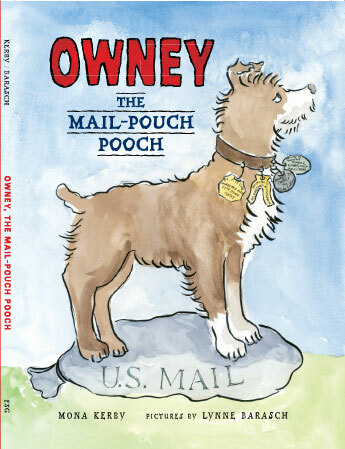 But it is an incredibly endearing, simply told story of a dog who showed up one day at the Albany Post Office in 1888 and went on to have a decade’s worth of adventures traveling the world as a representative of the US Postal Service. 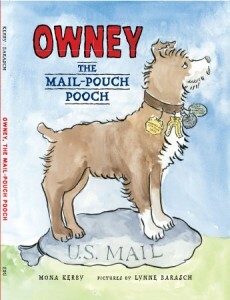 I think kids will really respond to the straightforward telling and beautiful rendering of Owney’s adventures, and adults will find a story they can read over and over again without suffocating on sweetness. Plus teachers can use this as a fantastic springboard into various history lessons. There are even a couple of photographs of the real Owney at the end, along with a brief biographical note about him. This is a fantastic addition to an elementary collection.